Here is a selection if images of exhibits and events around the Park. These images will change from time to time reflecting current happenings and news at State Mine. 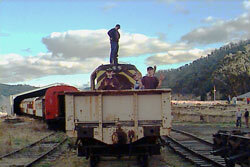 Local member of the NSW Parliament, Gerard Martin (right), inspects State Mine railcars at Lake Pillans with Mining Museum Vice-President Michael Wilson. 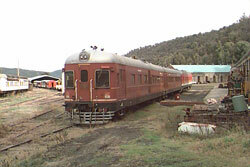 Former NSW SRA 620/720 Class Rail Cars at the Lake Pillans platform. These cars will soon operate the rail service throughout the Park. 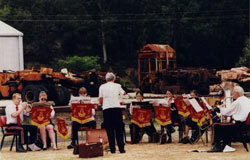 The Lithgow City Band provides entertainment on an Open Day. 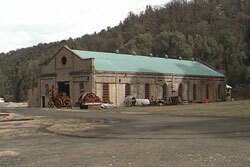 The State Mine Bathhouse is being restored as an exhibition space for mining machinery. 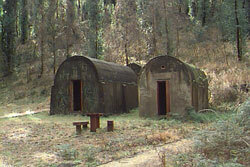 The Powder Magazine is a feature of the picnic area. 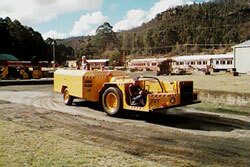 A ride in a Mine Bus is one of the popular attractions of Operating Days at State Mine. 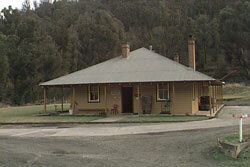 The former Mine Office now serves as the Museum with the Park's collection of mining memorabillia and artifacts. 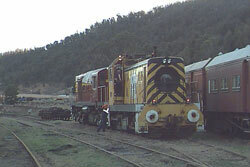 Former BHP diesel loco D23 and former NSW SRA 45 Class loco 4514 in the rail sidings. 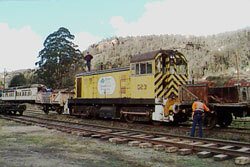 D23 prepares to take out a work train. 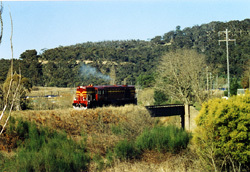 Former NSW SRA 45 Class loco 4514 crossing the Farmer's Creek bridge on the State Mine branch line. 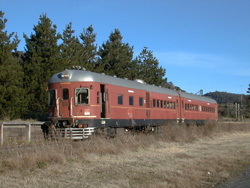 Former NSW SRA 620/720 Class Rail Cars will soon operate the rail service throughout the Park. A view of the train shed and storage roads with D23 and S truck in the foreground.